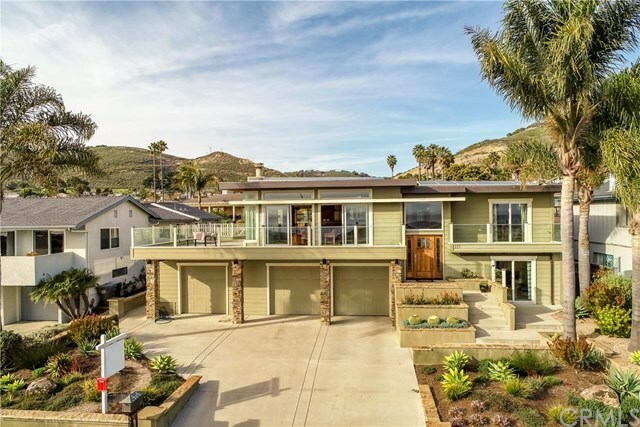 Spectacular ocean and coastline views from this completely updated 6 Plus bedroom 4 bath home with top of the line finishes throughout! Views may be enjoyed from all the main living areas and master suite. Open floor plan, high ceilings, tons of windows allows for enjoying the tremendous views! Top of the line finishes throughout from the beautiful maple flooring, cabinetry, custom built interior doors, wainscoting, and mitered corner windows. Each bathroom has exquisite custom made tile, stone, granite, recycled glass or concrete surfaces on the vanities and/or tub/shower surface areas. Extensive wrap around decking for enjoying the outdoors. Huge rear yard with citrus trees and large spacious patio. Some other amenities include an outdoor shower, central vac system, solar panels for energy, tons of storage, huge yard with citrus trees, hybrid car hook-up and more! Three car garage with lots of storage and an extra room for a hobbies or possible office. Homes in this neighborhood rarely come on the market. This one is turn-key and ready for you! Known for incredible weather, "Sunset Palisades" is one of the most sought after neighborhoods in the county. Just minutes to hiking tails, beach access. parks and world class restaurants.